Dog owners with big houses (and even smaller apartments, too) sometimes need to prevent their dogs from entering certain areas of the house. Dog gates and playpens for dogs have been created specifically for this purpose. Now the question is, how to choose the right pet gates for dogs? There are many questions that arise once you start shopping for pet playpens and trying to understand how to choose dog gates. Questions like “which ones are the best for apartment,” “which dog gates are good for big house,” “how to choose dog gates to use on stairs,” “what gates are good for bigger dogs,” “what pet gates to use with small dogs,” “can we use baby gates with dogs and vice versa,” “how to measure,” “will it hurt my dog,” and so forth. And it's no surprise! RELATED: What are the best dog gates for home? With so many types of dog gates on the market (as you can see in the linked article), it's difficult to make the right choice. Even when so much information is provided on the product's page on retailer's sites (such as Amazon), most questions remain unanswered. With that in mind, I will try to respond to all of your concerns and tell you how to choose dog gates and playpens for dogs in YOUR home! First, let's talk about the types of dog gates that exist out there. That's plenty, isn't? Which is why sometimes, choosing the correct gates for dogs in your home can become a daunting task. Who knows what you're going to buy, and then when it doesn't work, you have to go through all the trouble of repacking and sending the thing back just to order yet another unknown item without certainty of whether it's the right thing for you and your home. I've been there, trust me. So here's quick, short and sweet guide for you to learn how to choose dog gates and playpens for dogs that will definitely be the right fit. Let's break down all dog gate types separately. Certain types of dog gates are taller and heavier to prevent bigger dogs from stepping over them, jumping over them or simply knocking over the gates. These types of gates really are big and noticeable at home (that's not to say they can't fit within your home decor), therefore, oftentimes they will also have an entrance or doorway with a lock on it for you to be able to easily go through. 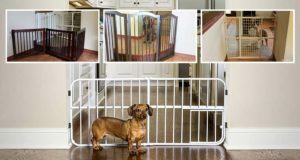 These types of containment systems are used to prevent your dogs from entering areas that are simply too large for regular pet or baby gates. Most of the time, these are useful when you want to secure not the doorway but rather a whole area, like part of the room. In the apartment, you want to use the type of gates that will be easy to put up and put down. Because of the limited amount of space in the apartment, freestanding types of gates (which I cover below in this article) would be the best choice for people who love to keep their dogs in the apartment. Gates for dogs that can be used outdoors are usually less attractive and more sturdy because they need to sustain more potential damage when outside. Most often, these will be used when attempting to contain your pet on the patio or in the backyard and not wanting to use inground electric dog fences or shock collars. Freestanding outdoor gates, or those with multiple panels that can be used outside are the best here. Some dog owners who travel a lot will run into complex situations and will occasionally require to bring gates with them to contain their pet dogs. For such occasions, certain portable dog gates are the best because they are easy to carry, pack, and put up. While not the most sturdiest, they get the job done for small to medium sized dogs. If you have more than one pet at home, and especially if those pets differ substantially in size (small dog and big dog, or even medium sized dog and a cat) – you're going to need a certain type of gates. That's the kind of gates with small doors on the inside. Any smaller animal will be able to pass through (toy dog breeds or any cat) but bigger animals will not. Yes – even temporary dog gates exist! For those busy houses where everybody is constantly walking around the place, or if you have guest over for dinner all the time, you can use some temporary pet gates for dogs. They are ultra-easy to put up and remove – similarly to those portable gates – and will still look nice, sturdy and do the job. If you have stairs at how, and you've taught your dog how to use stairs, occasionally you might want to prevent your pooch from entering or exiting the area to which only stairs would provide access to. Usually, that's the job for either gates that can be mounted into the wall, or something that can be placed independently right at the front of the stairway. Lastly, some pet owners might be concerned about their dogs on the deck/patio. Almost like the outdoor pet gates, the deck gates for pets can often be installed right into the deck itself. Any similar mounted gates would do a similar job, too. Make sure to avoid freestanding gates in these places, because just like with any outdoor – they won't work. Let's also quickly break these down what's what in one or two sentences. Freestanding or free standing pet gates for dogs, and freestanding fences for your pets, is a great way to keep your dogs away from specific areas that aren't too wide. This is the most universal type of barriers for dogs, and it's mobile. 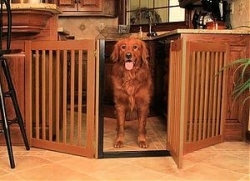 Most often, dog owners will use freestanding gates to barricade rooms, hallways, stairs. Some freestanding gates can even turn into playpens, that way providing you with more than just a barrier. An example of that type of gate would be the awesome 6-panel Richell ones. This type of pet gates is called pressure-mounted because of the method used to install the gates. Unlike other types of barriers and barricades, pressure mounted dog gates do not require any actual mounting of hardware, no need to drill through walls, or put in screws and ruin your home decor. These gates actually are very sturdy and stable, and they stay in place because of the tension, which is normally achieved through adjusting a knob on the dog gate. You can easily move these gates around your house without any trouble and whenever you need to. Normally, these gates are considered the easiest to install. A good quality example of pressure mounted dog gates would be Dreambaby pressure mount hallway gates. The hardware mounted pet gates for dogs are designed to be permanently affixed to your wall at home, or your doorway, in order to maximize the structural integrity of these pet gates, so to speak. Hardware mounted dog gates would usually need things like brackets, some tools, etc. for proper installation. This is obviously not a mobile solution, but it's the one that will be the sturdiest. If you're looking on Amazon, then a good example of such gates would be Supergate deluxe décor gates. Now the stairway gates for dogs are more specific. Stairway gates have been designed to only open in one direction, and that is away from the stairs, obviously. This simple but unique feature of the gates makes your stairs and stairway substantially safer to use once the gates have been put into place. Normally, stairway gates for dogs are dispatched with some sort of “adapter” that will allow you to control the direction in which these dog gates will open. You can also choose to install the gates without the adapter if you want. For stairway dog gates, I believe a great example on Amazon would be the Cardinal Gates stairway special gate. Simply as the title says, these are tall gates (or rather slightly taller than your normal pet gates or baby gates would be). This type of gates are often used with toddlers and maybe larger dogs that love to jump over things or knock them down. Tall gates for dogs are all higher than at least 38 inches. Some even have an optional/additional height extension if you need it. Here's a good example of tall dog gates – Bindaboo Hallway gate or North States Industries Supergate Extra Tall. Sounds a little confusing, doesn't it? Don't all gates have “openings”? Well, no – not really. What I mean by “openings for pets” are the smaller gaps or apertures that allow smaller pets to pass through the gates, such as when you buy the gate for your dog but want your cat to be able to go through those gates. These gates that keep your dog confined usually have a built-in “door” that allows you for more control over how your pets will roam the house. Most gates have retractable latches on those small doors which engage the door securely once it closes, but is still easy to unlatch when needed. Probably one of the best such gates with openings would be the popular Carlson 0930PW Extra-Wide Walk-Thru Gate. Just as it says, the all-wood dog gates are made completely out of wood (because some dog owners dislike having metal or plastic gates in the house). There are different types of all-wood gates, most of which include the specifics already mentioned above. If you're concerned about having your dog gates made completely out of wood, then this type will fit you right. Most importantly, you can find all those previously mentioned dog gates in “wood-only” category. For example, check out these Richell Wood Freestanding Pet Gate. In fact, I'm pretty sure all Richell dog gates are made out of wood, which is why they became so popular. I invented this name, I guess. So the wood and wire gates is exactly what it says: dog gates that are made out of these two components, and they were constructed to provide a lightweight durability and function in your house. The combination of wood and wire dog gates construction will not only provide you with a super-strong gates for pets, but they also allow your pets (and maybe even yourself?) for more visibility in home. See the details on this wood and wire baby from Richell – Richell Wood Freestanding Pet Gate. These gates are great for pet owners who also have kids, as such gates should normally be rated and certified by the JPMA (Juvenile Products Manufacturers Association). If dog gates have been certified by the organization, that means the gates are up to certain quality and safety standards. All JPMA-rated dog gates will have a certification seal on them as proof of the fact that manufacturer has gone through all ASTM‘s (American Society for Testing and Materials) requirements. Surprisingly, such gates aren't much more expensive, and you can find them on Amazon, too: Regalo 192-Inch Super Wide gate. For dog owners who are looking for either a temporary gate solution or simply can't afford anything solid, there are certain cheap dog gates out there that will do the job for a while. Usually, these are made out of plastic for a low cost, and are a great solution for occasions like travelling. There really isn't anything special about this type of dog gates, other than they're very simple, light and cheap. If you need one of these cost-effective solutions for temporary use, try one of the best cheap dog gates on Amazon (they're even metal!) – Carlson Mini Tuffy Metal Expandable Pet Gate. If you want plastic ones, take a look at North States Industries Supergate. For cheap barriers for pets made out of wood, there's also Evenflo Position gates. There are a lot of options in this category, but honestly, investing an additional $10-$20 will pay for itself by a substantial amount in terms of quality, ergonomics and durability. Cheap dog gates will always stay cheap. Or rather expanding dog gates… I already talked about this a little, but there are also additional expansions for your pet gates, if you need some extra width or height, or you possibly want to turn your dog gates into playpens for either pets or kids. These types of gates are slightly more expensive because of their functionality and features, but they are great for customization in case you want to move them around the house, or even from one home to another. This category of dog gates will present you with models that often have more than one choice for their extension options. If you can afford to spend that little bit extra on an extension – do it! You can thank me later once you realize how helpful that is. A good example of dog gates with extensions on Amazon is the already mentioned above Richell 6-panel gates, they are absolutely wonderful. For a more reasonable price you can also try Summer Infant Metal Expansion Gate. This is a little different that the expansion gates – I'm talking strictly about the extensions themselves. Yes, you can buy them separately if you find that your gates are too short! Unfortunately, you can buy extensions most of the time only from the same manufacturer where the gates came from, and even then they rarely have this type of feature. If you believe that you might need dog gate extensions later, opt in for Richell's 6-panel gate or find the type of pet gates that can be expanded with separately bought dog gate extensions. Here's a good example of dog gates with extensions: Dreambaby Extra Tall Swing Close Gate with Extensions, Black. And that's it. 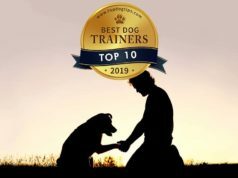 I believe I covered it all, and I sincerely hope that I answered the question of how to choose dog gates and that this information will provide to be useful for most dog owners looking to purchase their first pet gates for their Fido. Research well, compare and find the best prices before you commit to anything. Good luck with your purchase, and enjoy! Previous articleDog Cage for Sale – Where to Buy? awesome guide, Angela! Thank you very much! bookmarked.